A little under two years ago, early in 2017, we spent a week in Edinburgh as part of a longer journey. Of course we visited most of the places that tourists visit – the Castle, the Royal Mile, Holyrood House, the Burns memorial on the hill, the Scottish National Gallery and the gallery of Modern Art, as well as some fine whisky retailers, some excellent second-hand booksellers, a Christmas Market, a literary pub crawl and a good jazz show. I think about half my ancestry is Scots (a quarter Lowlander, a quarter Highlander, a quarter Irish and a quarter English) so I enjoyed most of this, but at a certain point I became a little melancholy. Old Edinburgh is basically a Georgian city, specifically designed a little over two hundred years ago to assert English dominance. The very names of the streets (Hanover, Princes etc.) tell you this; and much of the pipes-and-tartans pageantry comes from a legacy of taming and prettifying the Scots nation for English consumption and in the service of the British Empire. Let’s not forget that nearly all the supposedly “traditional” tartans were designed long after English dominance was assured. My melancholy was at its height when we visited the Scots National Portrait Gallery. In the lobby there are what the curators presumably think of as Scotland’s three most illustrious literary figures. 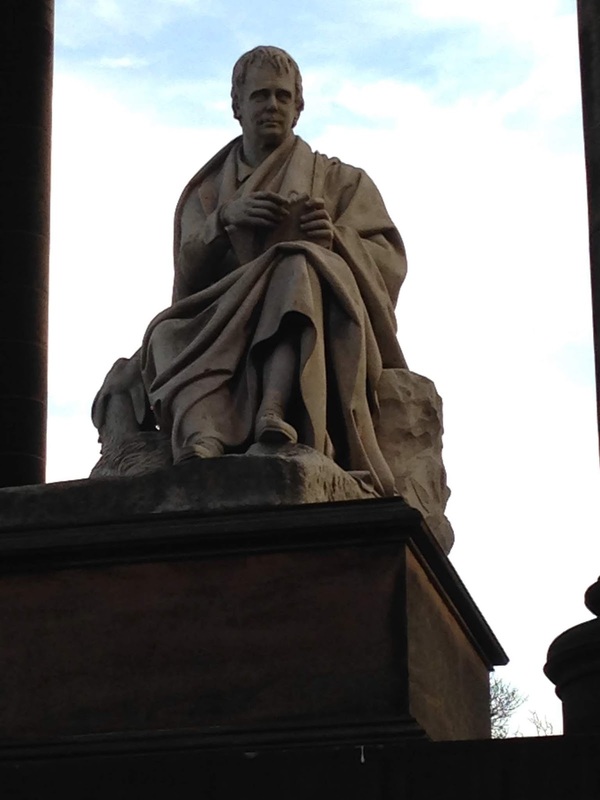 On the left there is a bust of Robert Louis Stevenson, in the middle there is a full-length statue of Robert Burns, but on the right there is a bust of Sir Walter Scott. Oh dear! Walter Scott (1771-1832), the man who did most to prettify Scottish history and customs for English readers (see my blog posting Truthis Beauty). His full-length monument dominates part of Princes Street, Edinburgh’s main drag. As I’ve noted once before on this blog (see the review of The Bride of Lammermoor), there was a time in my callow youth when I thought Scott was a writer worth reading. But, feeling that I have the right to make this judgment after wading through nine of his novels over the years, I have come to the conclusion that he is an appalling writer with his pompous Latinate vocabulary and stiff prose, which was unwieldy even in his own day. His plots as raw plots are interesting, if very melodramatic, and hence have sometimes made great source material for movies and operas. But his characters, though vivid, are thin, his descriptions are pasteboard and his ideas limited. So this is his legacy – a writer whose huge popularity across Europe in his own time tells us something about Romantic nostalgia and the state of early nineteenth century civilisation; and a writer who fired up opera librettists more than anybody apart from Shakespeare and perhaps Victor Hugo (and in the process inspired operas such as Lucia de Lammermoor which are greater works of art than their literary sources). In other words, he is now interesting mainly as part of cultural history. But it was that prettification-of-Scottish-history element that really got to me after my brief Edinburgh visit. So I recently sat down and read Scott’s book-length narrative poem The Lady of the Lake, to see if I had misjudged him from reading his novels only. Bear in mind that Scott first made his name as a poet and some of his shorter lyrics, such as “Proud Maisie”, have rightly earned their place in anthologies; although many of these lyrics originally appeared as part of his longer narrative poems. When The Lady of the Lake was first published in 1810, 25,000 copies were sold within the year. 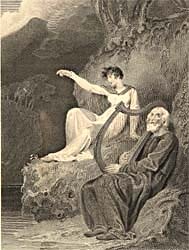 It was more popular than Scott’s earlier narrative poems The Lay of the Last Minstrel and Marmion and his later one The Lord of the Isles. It continued to be a big bestseller right throughout the Victorian age until, by the earlier 20th century, it ceased to be to anyone’s taste. I will not irritate you by synopsising it in detail. It is enough to say that it is set early in the 16th century, in the reign of King James V of Scotland, and its thematic focus is a contrast of wild highlanders and organised lowland authority. Its six cantos cover six days. 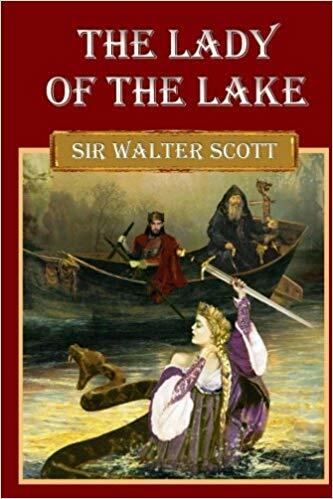 The highland chief Roderick Dhu, the lowland knight Sir James Fitz-James and the gentle Malcolm Graeme all vie for the hand of the “lady of the lake” Ellen Douglas, daughter of the clan chief The Douglas. Ellen rescues Sir James Fitz-James, when he has lost his way during a stag hunt in the highlands, by taking him to her father’s island hideaway on Loch Katrine. He falls easily in love with her, but departs soon after his rescue without ever meeting her father. The Douglas is not yet sure whether he should pledge allegiance to the king. At a highland clan gathering, Roderick Dhu and Malcolm Graeme quarrel over Ellen. But the more important matter is the highland rising the fiery Roderick Dhu is planning against the upstart lowlander King James V, who has declared his intention to make the highlands his own domain and hunting ground. Roderick Dhu finds it hard to gather allies for his uprising, but can rely on the support of his own Clan Alpine. At some point in the story, there is a duel between Roderick Dhu and Sir James Fitz-James. The highland uprising (it is reported to us only in the song of a minstrel) is quashed. Roderick Dhu is killed. 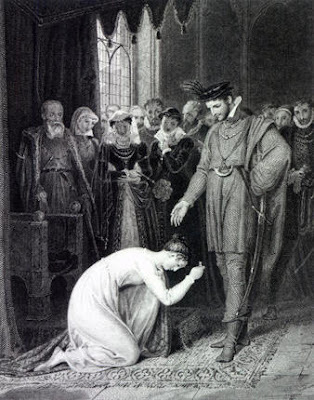 In the happy denouement Ellen gets Malcolm Graeme, the man to whom he father had betrothed her, and she discovers that the romantic knight James Fitz-James is in fact King James V himself, to whom The Douglas has already sworn allegiance. Highlands are now reconciled to lowlands. As with his novels, Scott’s narrative poems are really sustained by picturesque set-pieces. They are begging to be incorporated into an opera (and indeed this poem became the basis for Rossini’s opera La Donna del Lago – the first of fully 25 Italian operas, by various composers, to be drawn from the works of Scott). Think of how the following events in the poem could be set to music as arias or choruses - the wild stag hunt and the knight’s horse falling down dead of exhaustion in the opening canto. The romantic meeting of the knight and the “lady of the lake” on the shores of Loch Katrine before she takes him to the island. In Canto Two the old bard who reminds fair Ellen of her family’s allegiances. In Canto Three the pagan hermit who speaks a prophecy as he sacrifices a goat. Not to mention Roderick Dhu’s burning of a fiery cross to summon the clans (sorry folks, but this really is where the Ku Klux Klan got the idea to do the same thing) and the highlanders rising as one man out of the heather. And the scene where the king reveals who he really is. Etc. etc. etc. – all of them fitting subjects for illustrations in de luxe Victorian editions of this poem. Scott also inserts songs and ballads into each canto – in Canto One “Soldier rest, thy warfare o’er”; in Canto Two “Hail to the chief who in Triumph advances” The famous dirge “Coronach” (“He is gone on the mountain / He is lost to the forest”) in Canto Three, and later Ellen’s hymn to the Virgin Mary; in Canto Six a very vigorous soldiers’ drinking song, almost as good as Robbie Burns writing in the same boozy vein. It is in these shorter self-contained lyrics that Scott’s poetry is at its best. O were his senses false or true? The rhythm and rhyme-scheme are simply wrong for lines that are presumably meant to convery a sense of slightly melancholy reverie. Such rhythm and rhyme-scheme are, however, quite appropriate to the scenes of vigorous action. My vesper song thy wail, sweet maid! Crag over crag, and fell o’er fell. So where are we left in assessing Scott’s “epic” verse? 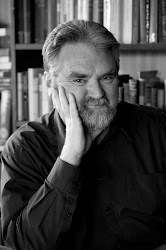 Let me not take one iota away from the industry and diligence of Scott, who wrote so many novels in such a short time and worked off great debts in doing so. A truly heroic feat. Let me not presume to say that he had no imagination, because he did indeed create memorable characters, even if they are mainly broad caricatures. Above all, let me not deny that he wrote some good short lyrics. 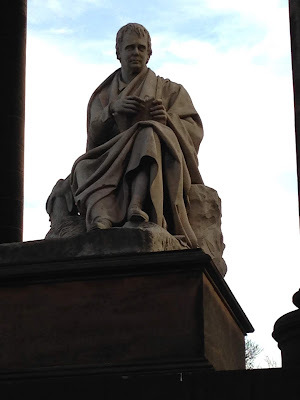 But I cannot help agreeing most with William Hazlitt in his Lectures on English [sic] Poets, where he praises Scott’s best qualities but says that in the end his long narrative poems are “masquerades” as far as history is concerned – pretty, picturesque, but having little to do with real history. And, in a passage which (dammit!) I cannot specifically source at the moment, Hazlitt also said that to read Scott’s verse was like watching a troop of soldiers marching by – orderly, regular, neat and somehow lacking the spark of real poetic inspiration. In the end, much of his narrative verse is gifted doggerel. Finally, of course, I have to come back to that question about Scottish nationalism which I raised in the earlier parts of this rant. Consider how The Lady of the Lake ends. Those wild, brave, but uncouth highlanders submit to the lowland king. Yes, they are picturesque and romantic, but they have served their turn, so now real civilisation may come. We Anglophones are the bearers of real civilisation. So let us look on those mountain Gaels as an interesting artefact of the past, about whom we can write Romantic poems without bothering to consider how much we have despoiled them of their land and culture. It is all rather in the way that Henry Wadsworth Longfellow’s Hiawatha ends. Having featured as the hero of a long poem, at the end Hiawatha, with no fuss or protest, conveniently shuffles off into the mists of time to make way for the Paleface. And we don’t have to consider how we really took the land from the tribes whom we have romanticised. Thus does Scott in The Lady of the Lake feed his English fan base.